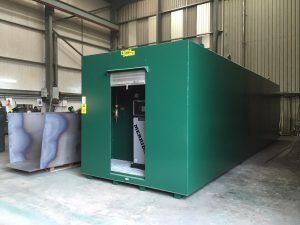 Tuffa have manufactured and delivered a 45000 litre steel diesel dispensing tank recently for a Norwich haulage company for use with their large fleet of vehicles. The 45000 litre steel diesel dispensing tank was fitted out with the Merridale Auditor 70lpm pump with built in fuel management system, and Merridale GT1 level gauge and alarms. The bulk storage tank measured up at 10 metres in length, including the 1m deep walk in security cabinet, 2.5 metres wide and 2.5 metres high. Our skilled workforce manufacture a range of bunded steel diesel tanks in-house at our factory in Uttoxeter. Standard sizes include 1100L, 1400L, 1800L, 2700L, 5000L, 10000L, 15000L, 20000L and larger tank sizes are available on request; the largest manufactured to date being a 189,000 litre!